Chocolate Roll-On Warm Wax is produced by the Spanish brand BYLY. It is designed to easily remove unwanted body hair. Due to a convenient roll-on applicator, the product is easy to apply. Thanks to its special formula the wax effectively removes even the shortest hair and helps to keep your skin smooth for up to 4 weeks. 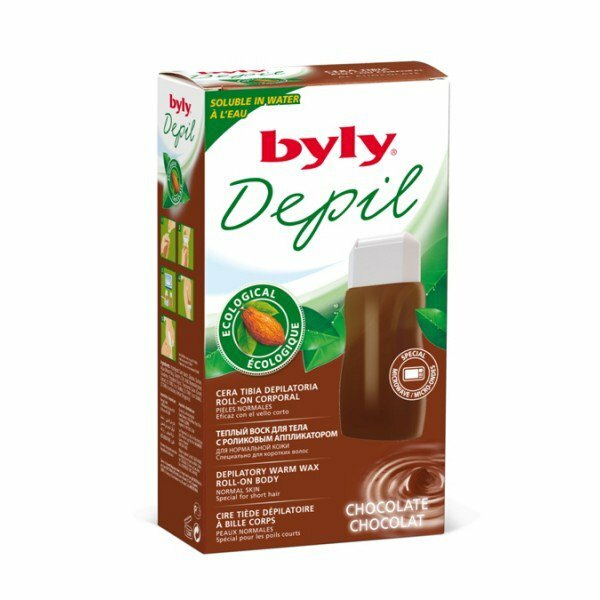 This BYLY Depil roll-on warm wax with chocolate is designed for normal skin. It is designed to use at home and does not require any special devices for heating, you can heat it in the microwave or in boiling water. The wax has a special dermoelastic formula, it excellently adapts to the curves of the body and adheres to each hair. The product is formulated with cocoa bean extract that effectively moisturises the skin, relieves irritation, stimulates skin cell regeneration, makes your skin silky smooth and glowing. The wax is enriched with glycerol that is known for its softening properties and helps to keep the skin hydrated. Package contents. 125 ml (175 g) container of wax, 12 fabric strips (reusable), 1 roll-on applicator. Directions. Remove the container cap and mount the roll-on applicator on top of the container. Heat the wax in the microwave or in boiling water. Using the applicator, spread the wax evenly to fully coat the hair. Use the fabric strips to remove the wax. Rinse off the residue with warm water. Precautions. Do not use on spotty, irritated, sunburnt, inflamed or injured skin, moles, scars, or varicose veins. Read the instructions carefully before applying the wax. Ingredients. Hydrolized Corn Starch, Glucose, Sucrose, Aqua (Water), Glycerin, Citric Acid, Styrene/Acrylates Copolymer, Propylene Glycol, Theobroma Cacao (Cocoa) Extract, CI 77492 (Iron Oxides), CI 77491 (Iron Oxides), CI 77499 (Iron Oxides), Parfum (Fragrance). Want to buy Chocolate Roll-On Warm Wax? Call us or submit your order via our web site! I've tried all at-home epilation methods and I like waxing the best. This roll-on wax provided the easiest experience I've ever had. It is very easy to apply and works wonderfully. Of course, wax is messy but even the professionals get messy sometimes. Just make sure not to overeheat it (otherwize it will start oozing out from the applicator) and you'll be okay!